The 14+ acre former Rupert Murdochs News International Print Works site stopped printing in 4.2008 and eventually sold in 2011 and acquired by St George City Limited (SGCL) part of the Berkeley Group of companies. SGCL had to arrange for the demolition and site clearance of the main printworks buildings being a steel framed and RC structures (upto 35m high) whilst protecting and refurbishing the adjacent Grade II listed Pennington Street Warehouse (formerly known as the Rum Warehouse). The London Docks site will be developed with high quality residential and commercial buildings. 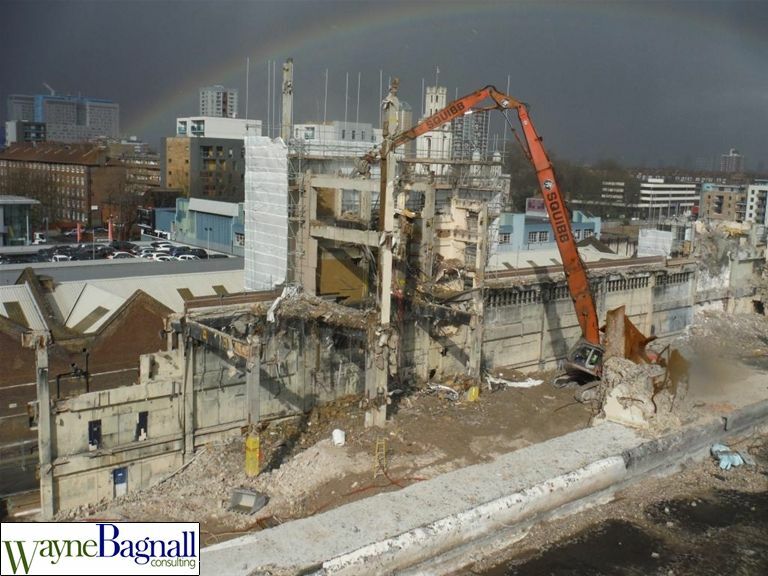 Wayne Bagnall Ltd was engaged by SGCL to assist the client to plan, procure and oversee the demolition works which could only take place after due consideration, local residential meetings, liaisons with the London Borough of Tower Hamlets being the governing local authority and other stakeholders. These meetings commenced in the Spring of 2013 with a Section 61 agreement reached in the Spring of 2014 before the demolition works could be commenced. The works had to be planned and carried out in accordance with the highest standards in particular The Construction (Design & Managment) Regs 2007 and the latest BS 6187: 2011 Code of practice for full and final demolition. 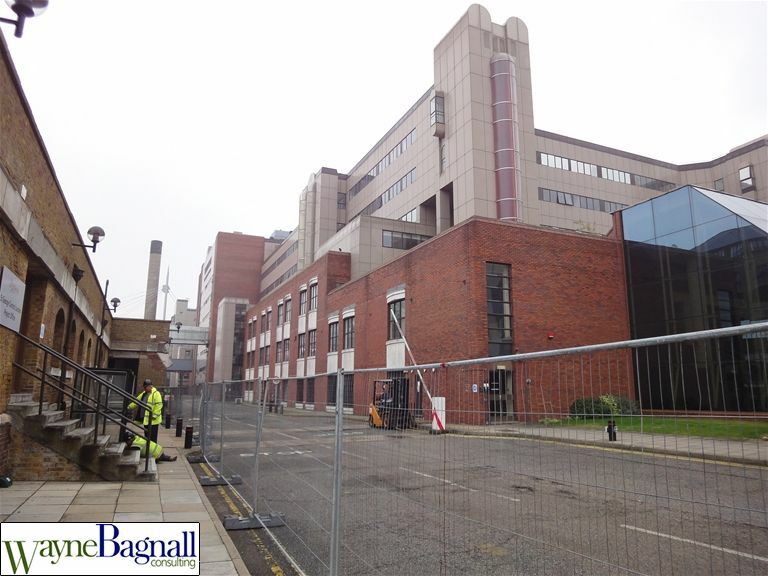 It was agreed I would carry out unannounced safety audits of the works for and on behalf of the client. 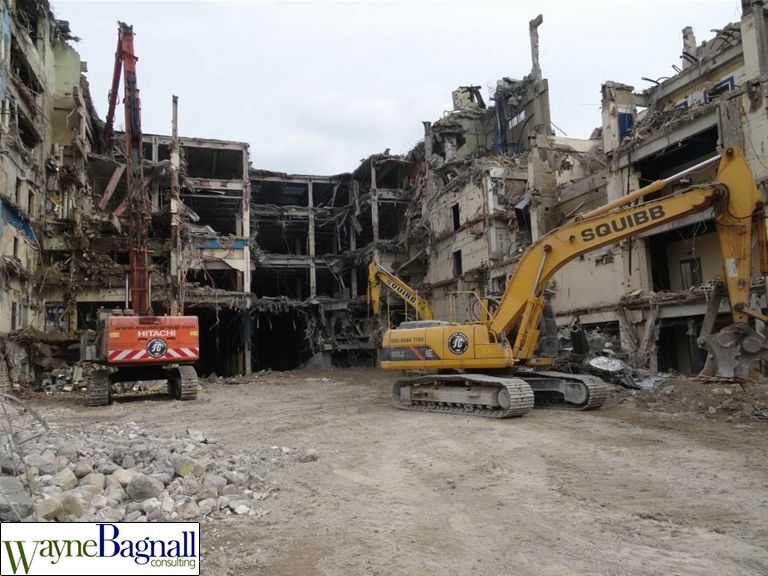 Following pre-qualification and due diligence checks SGCL awarded the Demolition Contract to the Squibb Group who commenced work enabling works in Spring 2014. SGCL appointed Butler & Young Consultants Ltd as the CDM-C and Squibb Group as the Principal Contractor (PC). The enabling works commenced with various Surveys to compile suitable PCI (pre construction info), developed RA/MS into a plan of works in accordance with Reg 29 of the CDM Regs 2007. The North Section of the Printworks (approx 50% of the Printworks) was completed predominatly by remote mnechanical high reach demolition in March 2015 with the remaining South section of the building to start shortly. Sustainability has been a high priority with circa 95% of all the demolition arisings being re-used and recycled with some being used on site for the new construction. This is an enormous high profile demolition project in the middle of London adjacent to the Tower of London and St Katherine's Dock. I am pleased with the management and control of the works so far but remind everyone that vigilence must be maintained to ensure the SHEQ issues contine to be managed to an acceptable level.